This narrative relief illustrates a scene from a popular thirteenth-century text that emphasized the humanity of Christ and the Virgin Mary. With the Christ child on her lap, Mary is approached by young Saint John the Baptist and his mother, the Virgin's cousin Saint Elizabeth. The elderly Elizabeth helps her son along as he walks toward Jesus to offer him a globe, a sign of Christ's role as savior of the world. Two small boys, possibly angels, accompany the group. At the center of the relief, a prominently placed tree likely signifies the Tree of Life. The relief may have formed part of a larger sculptural complex, although it would also have been appropriate for an altar. 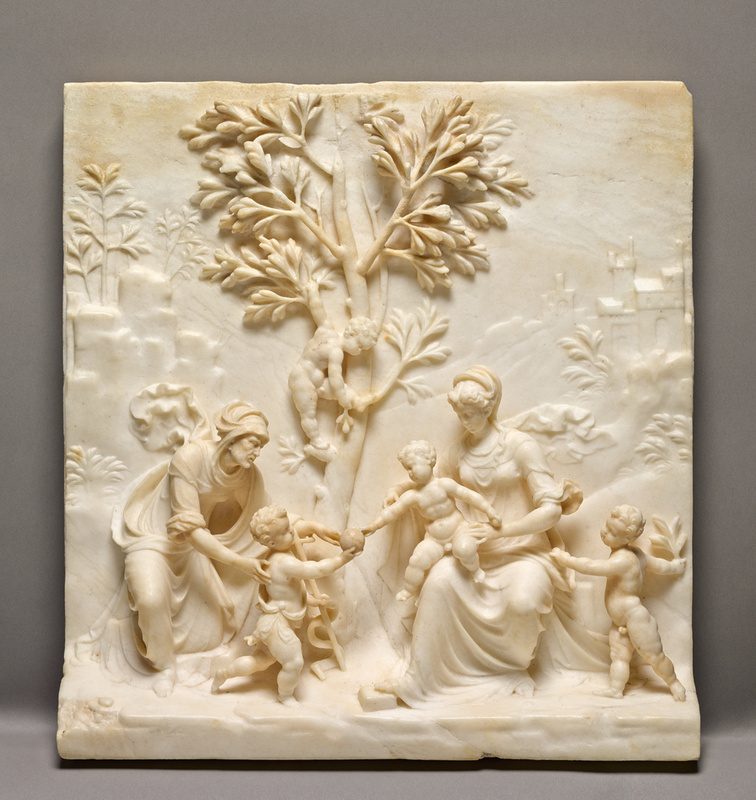 Because of the rarity of its subject and its extraordinarily high quality, it is also possible that the relief stood on its own as a devotional image in a private chapel. Source: Exhibited Burlington Fine Arts Club, 1913. Private Collection (Rhodesia), by inheritance to the owner's niece, Mrs. F. W. W. Bernard. Mr. and Mrs. F. W. W. Bernard (St. John, Jersey, Channel Islands), sold by private treaty through Sotheby's, London to the J. Paul Getty Museum. Phillips, C. "Marmi e bronzi del rinascimento italiano". Archivio storico dell'arte, I (1888), pp. 100-1. Burlington Fine Arts Club. Catalogue of a Collection of Italian Sculpture and Other Plastic Art of the Renaissance (London: [Chiswick Press], 1913), pl. xxiv. Baroni, C. "Problemi di scultura manieristica lombarda." Le Arti 5 (June 1943), p. 189. Pope-Henessy, J. Catalogue of Italian Sculpture in the Victoria and Albert Museum (London, 1964), vol. 2, p. 549. Fiorio, Maria Teresa. "Un relievo referibile a Bambaia e qualche osservazione sull'incidenza della pittura leonardesca sulla scultura lombarda." Raccolta vinciana 23 (1989), p. 66, n. 9. Agnosti, G. Bambaia e il classicismo lombardo (Turin, 1990), p. 32, 44, no. 109. Fiorio, Maria-Teresa. Bambaia: Catalogo completo delle opere (Florence, 1990), p. 152. Fogelman, Peggy, and Peter Fusco, with Marietta Cambareri. Italian and Spanish Sculpture: Catalogue of the J. Paul Getty Museum (Los Angeles: J. Paul Getty Museum, 2002), pp. 30-37, no. 5. Fogelman, Peggy, and Peter Fusco, with Marietta Cambareri. Italian and Spanish Sculpture: Catalogue of the J. Paul Getty Museum Collection (Los Angeles: J. Paul Getty Museum, 2002), pp. 30-37, ills. 5, 5B-5E.